The World is waiting for America to lead. 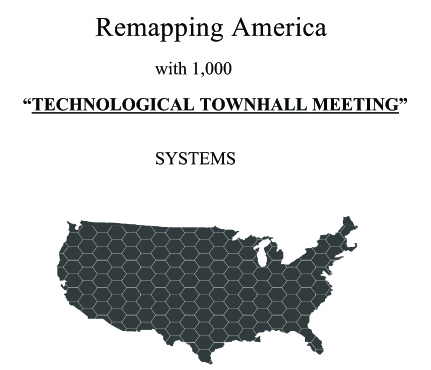 America now has the Plan and Technology to give Every Citizen One Voice Now. The plan can NOW be used in Every Country around the World giving a Voice and Freedom to all Citizens of the World Equally! Our mission is to educate and give a voice to the people of our community by establishing the communication technology, which allows them to participate and have a continuous voice on governmental, political, and community issues. way to build a bright future for our children and theirs. YOU THE PEOPLE raise the issues to make your community better. YOU THE PEOPLE vote on those issues with any touch tone phone. The Politicians have figured this trick out a long time ago. They have been remapping America forever with Gerrymandering. Gerrymandering is remapping a district so they can get either elected or re-elected. The Postal Service figured it out by remapping America with Zip Codes. The Phone Company figured it out by Remapping America with Area Codes..